DEAR JERRY: I know the peak time for quadraphonic albums is around 1975. 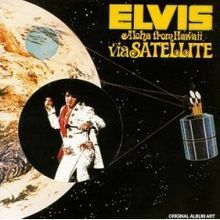 However, the first quad LP I bought was “Aloha from Hawaii via Satellite,” the soundtrack of Elvis Presley's 1973 Honolulu concert. Since this came out before quad's heyday, might it be the very first quad album? I'll bet it is the top-selling quad release. Also, did anyone ever make quad singles? This January 14, 1973 event is the first entertainment show of any type broadcast worldwide via satellite. Though not all countries caught it at the same time, over 1.5 billion — then about a third of the world's population — watched a 1973 first-run telecast. Since then, millions more viewed the DVDs and TV replays. 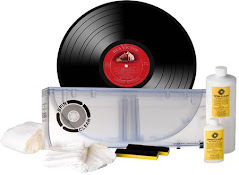 When the two-disc soundtrack album (RCA VPSX-6089) topped the nation's LP charts (May 5, 1973), it became the first quadraphonic album reaching No. 1. With nearly six million units sold (platinum to the sixth degree) it remains history's top-selling quad LP, by a distance wider than from Honolulu to the mainland. Noteworthy too is there was no set ticket price. Concert-goers simply made a donation, with 100% of the amount of ticket and souvenir sales going to the Kui Lee Cancer Fund. Elvis proudly announced the total raised as $75,000. 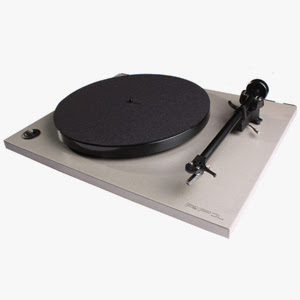 It is one of very few albums in general distribution made exclusively in the quad — RCA named it QuadraDisc — format, at least until 1976. By then, the industry began phasing out the quad experiment. This and other former quad product then came out in ordinary stereo. Inexplicably, all 1973 versions of “Aloha from Hawaii via Satellite” made specifically for the RCA Record Club (RCA R2-213736) are standard two-channel stereo, not QuadraDisc. In May 1974, RCA issued a special 7-inch EP (DTF0-2006) just for juke box operators. This oddity was not made in quad because they created it strictly for stereo juke boxes. Meanwhile, back on the LP front, Columbia announced in November 1973 some early yet impressive numbers for quad album sales: “Abaraxas” (Santana) 90,000; “Bridge Over Troubled Water” (Simon & Garfunkel) 62,500; “Greatest Hits” (Sly and the Family Stone) 62,300; “Pearl” (Janis Joplin) 55,400; “Summer of '42” (Peter Nero) 40,200; and “Loggins & Messina” (Kenny Loggins & Jim Messina) 30,800. Fueled by such encouraging sales, Columbia quickly began production of quad singles, the first of which was Art Garfunkel's Top 10 hit at the time, “All I Know” (Columbia 45926). Because of the enormous demand for Quadraphonic sound, Columbia is proud to release its first SQ Quadraphonic single, featuring the renowned artist, Art Garfunkel. If you transmit in FM-stereo, you may now broadcast Columbia SQ Quadraphonic discs, both singles and albums, or your own stereo tape cartridges recorded from these discs, with no modifications to your present equipment. Produced by Carl Wilson, of the Beach Boys, and on their personal label (Brother BR-2500), “The Flame” is widely-regarded as the first quad LP. SQ did have its audio shortcomings, so along came Japan's Sansui and their QS (Quadraphonic Stereo), an improved and competing technology. In July 1972, at a London expo, RCA unveiled its QS encoded system, and promised about 15 QuadraDiscs by the end of the year. Much like the famous Betamax vs. VHS video tape battle that lay ahead, SQ (Sony/CBS/Columbia) and QS (RCA/Sansui/JVC/Panasonic) were completely incompatible, creating a nightmare for consumers. No matter which decoder they owned, many fine quad LPs existed that their system could not properly play. This boondoggle is the main reason cited for the death of quadraphonic recordings, although the basic four-channel system, with a center speaker added, returned successfully in the '80s as home theater, otherwise known as surround sound. IZ ZAT SO? Quad devotees in the '70s wanted either long-playing albums or pre-recorded tapes, not singles. Accordingly, Columbia, and later other labels, produced quad singles for two purposes: first for FM radio, then for quadraphonic juke boxes. In 1974, right after Columbia's first batch of quad singles for radio, Seeburg wanted in on the new craze. They modified their 80-disc STD-160 and came up with the SQS-160. Unfortunately, with CBS's SQ encoding, the result was a simulated version of quad. Chances are the patrons in noisy bars and restaurants never knew the difference. I love this album cover art! "Overlord", a brand new song from Colorado power metallers JAG PANZER, can be streamed using the audio player below (courtesy of AOL's Noisecreep). 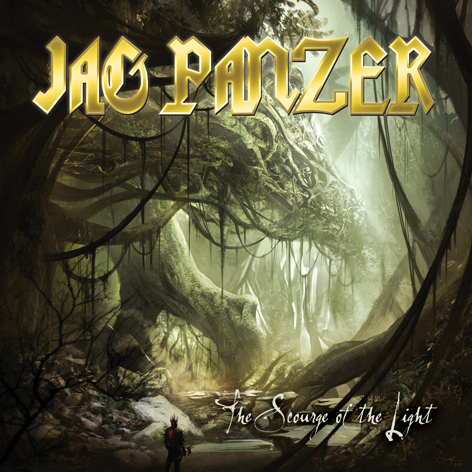 The track comes off the band's new album, "Scourge Of The Light", which was released on February 28 in Europe (except in Germany, where it will arrive three days earlier) and will be made avaialble on March 8 in the U.S. via SPV/Steamhammer Records. In addition to the regular CD version, the effort will be made available as a double-vinyl set. The cover artwork for "Scourge Of The Light" is available below. It was painted by Los Angeles artist Justin Yun. 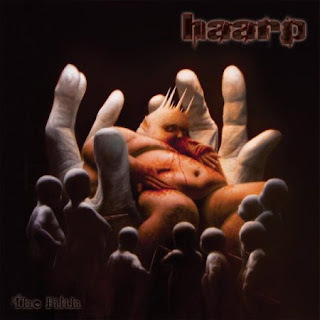 Patrick of Full Metal Rock recently conducted an interview with the New Orleans heavy metal act HAARP. You can now watch the chat below. HAARP's new album, "The Filth", was released on November 23, 2010 via Housecore Records. Produced by Housecore owner Philip Anselmo (DOWN, PANTERA), the CD is described in a press release as "an ugly, oppressive journey into heavy metal." The album features cover artwork by famed artist and tattoo master Paul Booth. This summer, the rockers are set to release a new live disc dubbed 'Mirrorball,' which will include three new studio songs alongside popular live cuts. The album will be packaged with a DVD of bonus performances and the obligatory backstage footage. Victory Records has announced that they will be re-releasing A Day To Remember's 'For Those Who Have A Heart' and 'Homesick' as well as 'Attack Of The Killer B-Sides' on vinyl. A GOOD song can become a great one on the simple turn of a melody. So, too, can a songwriter of promise reach his or her potential by honing in on the things they do best. Those were the thoughts going through Alex Gow's mind as he approached the recording of his band Oh Mercy's second album, Great Barrier Grief. Much has changed since the Melbourne outfit broke ground with its album Privileged Woes in 2009, a debut that earned it critical acclaim, a small but devoted fan base and an Australian Music Prize nomination. GENEVA — In the music business, what goes around comes around ... literally. In the front part of Area Records and Music on 74 Seneca St. is a vinyl records section, featuring new and used albums. Although downloadable music may be the medium of choice these days, there has been a resurgence in vinyl, said Area Records owner Mikel George. In fact, record sales increased about 15 percent nationally last year over 2009 figures. Keeping pace with such music industry trends, remaining independent and diversification have worked well for George, who first opened Area Records in September 1977 at One Franklin Square. When he started the business, working alongside him selling records and stereo accessories were Al Liberio and Jeff Melito, who still works at the store today. and in North Carolina, a record store is booming! In less than seven years, Harvest Records has grown from a struggling upstart to an Asheville music institution. In addition to serving the region's music-buying public, owners Matt Schnable and Mark Capon have released a host of albums on their own Harvest Recordings imprint, brought dozens of national touring acts to Asheville and spearheaded a successful music festival. Harvest has managed to thrive — even as CD sales plummet and the overall economy tanks. In 1955, Bo Diddley has his first recording session at Universal Recording Studio in Chicago, where he lays down "Bo Diddley", which will top the US R&B chart by the following June. In 1963, the Cascades achieved their only Billboard Top 40 hit when "Rhythm Of The Rain" topped out at #3. "Twist and Shout" by the Beatles was released in the U.S in 1964. At the ninth annual Grammy Awards in 1967, Frank Sinatra wins Record of the Year for "Strangers in the Night" and Album Of The Year for "Sinatra, a Man and His Music". Song of the Year goes to John Lennon and Paul McCartney's "Michelle" and The New Vaudeville Band wins Best Contemporary Rock and Roll Recording for "Winchester Cathedral". At the 11th Grammy Awards held in 1969, Glen Campbell is presented with Album Of The Year honors for "By The Time I Get To Phoenix" and Simon and Garfunkel's "Mrs. Robinson" is named Record Of The Year. Jose Feliciano is dubbed Best New Artist and the Bobby Russell composition "Little Green Apples" is given the nod as Song Of The Year. Mason Williams won Best Instrumental Performance for "Classical Gas" and Judy Collins takes home a statue for Best Folk Performance for "Both Sides Now". In 1974, Terry Jacks, who had left The Poppy Family in 1970, had the top song in the US with "Season's In The Sun". The tune was originally written in French, titled "Le Moribund" ("The Dying Man") and recorded as an album cut by The Kingston Trio. It was recommended by Jacks to The Beach Boys, who did record it, but declined to release it. Their decision worked out well for Jacks, who sold over eleven and a half million copies of the record. 1975 - Los Angeles Police pull over Paul McCartney's Lincoln Continental for allegedly running a red light. They detect the smell of marijuana and arrest Linda McCartney for having six to eight ounces of the drug in her pocketbook. Paul was driving but is not charged with anything. In 1983, Sony, Philips and Polygram introduce a revolutionary new digital audio system called a Compact Disc that contains up to 1 hour of music. Paul Simon's "Graceland" is named Record Of The Year at the 30th Grammy Awards in 1988. "Bring On The Night" by Sting is awarded Best Pop Vocal Performance and George Michael and Aretha Franklin win Best R&B Performance for "I Knew You Were Waiting (For Me)". In 1991, 21 years after its initial release, "All Right Now" by Free reached #2 on the UK singles chart when it was reissued to coincide with its use in a Wrigley's Chewing gum TV ad. In 1999, Dusty Springfield died of breast cancer at the age of 59, after a five year battle. She would be inducted into the Rock and Roll Hall of Fame less than two weeks after she passed away. In 2003, Hank Ballard, the writer and original performer of "The Twist", died at his Los Angeles home after suffering from throat cancer. His exact age is uncertain as most biographies say he was 66, but friends say he was actually 75. He originally released "The Twist" on the B-side of his 1959 tune "Teardrops On Your Letter", but after Chubby Checker took the song to number one, Ballard re-released his version and had a top 30 hit with it as well in 1960. He was inducted into the Rock and Roll Hall of Fame in 1990. 2005 - The iTunes Music Store reached 300 million songs sold. BURBANK, CA--(Marketwire - March 2, 2011) - Tom Petty and The Heartbreakers will celebrate worldwide Record Store Day on April 16 by re-releasing in limited editions their first two albums on 120-gram colored vinyl. These special editions of "Tom Petty and The Heartbreakers" (on white vinyl) and "You're Gonna Get It!" (on blue vinyl) will be limited for sale at the 700 independently owned record stores in the USA and hundreds of similar stores internationally. The press run for each album will be 2,500 copies in the USA and Canada and 2,000 copies in Europe and Asia for a total press run of only 4,500 copies worldwide. "Tom Petty and The Heartbreakers," the band's debut album, was originally released in 1976. The album is best known for introducing the world to the classic tracks "American Girl" and "Breakdown." Writing in the LA Times about the Heartbreakers during their first album campaign Robert Hilburn declared, "There's a purity in the group's music that combines the shadowy, late night compulsion of the Rolling Stones' 'Exile On Main Street' with the classic American immediacy that can be traced back to Elvis and Eddie Cochran." "You're Gonna Get It!" Tom Petty and The Heartbreakers' second album was released in 1978. Building on the edgy yet always melodic sonic template created on their debut, this album features the hits "Listen To Her Heart" and "I Need To Know" which remain staples in the classic rock songbook. Other gems include the boogie "Too Much Ain't Enough" which showcases Mike Campbell's blistering guitar as well as the deep and groovy "Restless" and the wonderfully ominous opener "When The Time Comes." Reviewing "You're Gonna Get It!" Rolling Stone called the album "exciting (with) fresh hints of openness and expansion just beneath the surface. The rhythms are a bit looser, and there's a new emphasis on Petty's rough, driving, rock & roll guitar in the mix."